The Ranunculaceae Group, one of the newest groups in the Hardy Plant Society, was formed in 2007; its aims are to inform, educate and enthuse about numerous ranunculids, by means of two Newsletters a year and an Annual Meeting. It now has just over 100 members from the UK, Europe and the USA, and has as its patrons renowned plantsmen Bleddyn Wynn-Jones and Dan Hinkley. The botanical buttercup family Ranunculaceae, perhaps one of the most familiar and well-loved of all the plant families, derives its name from the Latin rana, a frog, because many of its members thrive in damp places. There are about 60 genera and 2500 species, more than enough to retain the interest of the members of the Ranunculaceae Group for many years! Many species and cultivars of this large family of plants are widely grown in our mixed or herbaceous borders, such as Actaea, Aconitum, Adonis, Aquilegia, Anemone, Beesia, Caltha, Clematis, Delphinium, Eranthis, Hepatica, Helleborus, Pulsatilla, Ranunculus, Thalictrum and Trollius. The family also includes other less well known members such as Asteropyrum, Isopyrum, Oxygraphis, Semiaquilegia, and Paraquilegia, and there is even a woody shrub, Xanthorhiza, from North America, which is usually placed within the buttercup family. This is produced twice a year, in Spring and Autumn, and includes members' articles and notes on a wide variety of ranunculaceae species and cultivars. It is hoped that as many members as possible will contribute so that it can become a forum for discussion on topics of interest, such as tips on cultivation, members' favourite ranunculids, in-depth accounts of a particular genus and plant hunting in remote places. Our annual get-together features guest speakers, garden visits and of course the chance to buy plants from specialist nurseries and a members' sales table. We plan to visit a different venue each year so that as many members as possible have a chance to attend and to vary the date so that different groups of plants can form the main focus. Why not consider joining our group and enjoy reduced fees when attending our study Days? Current rates and application forms are available under 'Further Information' below. The sun was shining brightly on the morning of the 15th September, when the Ranunculaceae Group gathered at Laughton Village Hall, East Sussex for some light refreshment, before setting off down the lane to that wonderful garden and nursery Marchants Hardy Plants, owned by the renowned nurseryman Graham Gough. Graham welcomed us into his garden and nursery and as is usual for Hardy Planters, many made straight for the amazing variety of plants on sale, all looking in excellent condition, considering the heat we had over the previous months. With the retail therapy over, members were able to wander around Graham’s stunning garden, with its winding paths, whose borders overflowed with late summer colour and the tall grasses glistening in the sun. The boundary hedges mirror the rolling Sussex hills in the distance, making the garden feel as one. We returned to Laughton Village Hall for lunch and once refreshed, we were delighted to welcome our speaker Gill Regan, whose talk that afternoon was on ‘Ranunculaceae and their relatives’. Gill showed some amazing pictures of the various forms of buttercups from around the world. 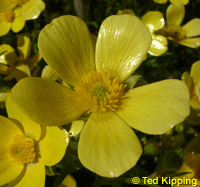 She then described the different plants within the buttercup family, many of which she and her husband had seen growing in the wild, not only in the United Kingdom and Europe, but as far away as New Zealand and South America. Gill concluded her talk with beautiful pictures of species that were new to many of us. And just to put the ‘Icing on the Cake’, we finished the day with delicious tea and cakes. The next meeting of the Ranunculaceae Group is going up country to the North West of England, to the village of Silverdale, near Carnforth, Lancashire on Sunday 17 March 2019. Following the AGM we have our annual lecture presented by Diane Clement speaking on ‘Hepaticas – a growing obsession’. Diane is the Alpine Garden Society’s Director of the Seed Exchange and is also an exhibitor and judge for the AGS. Hepaticas are one of her plant interests, along with other bulbous and woodland plants, which she grows in her shady garden in Wolverhampton. Her talk will look at the genus and where they come from. She will explain how to grow hepatica from seed, including how to pot on and give advice on all-round care of the plants. She will bring seed and plants for sale. In the afternoon we will visit Glenn Shapiro’s nursery at her home in Silverdale, which holds her National Collection of Hepaticas. It was her late friend Betty Kershaw, who encouraged Glenn join Plant Heritage way back in 2006. Then in 2009, she heard that Michael Myers had given up his National Collection and as Glenn had just retired from sheep farming, felt another serious interest was required. She had collected most of the genus that was readily available, but to be able to gain the more unusual species she decided to become a National Collection Holder. It was in 2010 that she was awarded the National Collection Status for Hepatica species and cultivars (excluding H. noblis var japonica cultivars). Glenn will be selling her Hepaticas at this event. We hope this has whetted your appetite to attend our next meeting, and we look forward to seeing you in March, for a really interesting and informative day, with a plant or two added in! If you are travelling up from the South and would like to make it a really interesting weekend, on the Saturday 16 March 2019 the Alpine Garden Society Show is on in Kendal. If you are already a member of the HPS and these snippets of information give you food for thought and you would like to join our enthusiastic group, please click on the following link if you wish to pay by cheque application form (pdf) or if you would prefer to pay by Electronic Transfer please click on the following link for details. Annual subscription rates run from 1st January to 31st December each year. £4 Single or £6 Joint (two members at one address) for one year. £12 Single or £18 Joint for 3 years. £5 Single or £7 Joint per annum. To join the group please complete the downloadable application forms above. There is a choice of payment by cheque, or electronic transfer.